This beguiling 300-year-old estate, called Quinta Vila Nova, is surrounded by vineyards and offers the best of both worlds: a peaceful rural setting as a great base for exploring the beautiful Douro region, and just 45 km away, the cosmopolitan attractions of the beautiful city of Porto. 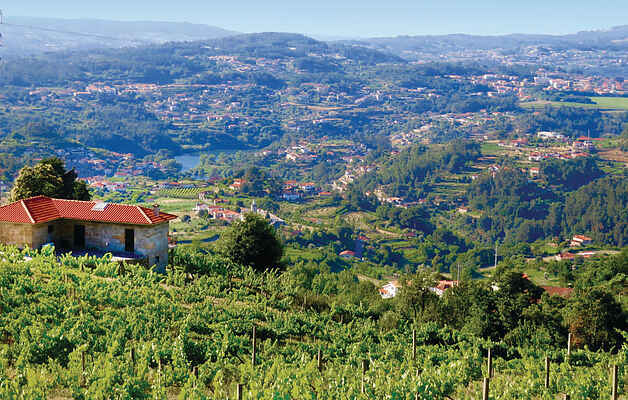 The 6-hectare family owned former farm is the place to be for lovers of Douro wine or Vinho Verde, the green sparkling wine made by traditional methods. The property offers the organic fruits which are growing on the property, an unforgettable experience of September harvest, the communal swimming pool of 56 m², with a view of vineyards and green hills, invites for a cooling swim during lazy and sunny afternoon. There are all kinds of lovely activities nearby. You can make your own olive oil with an old olive press, or take private paint lessons with one of the most famous Portuguese painters, Mr. Carlos Carreira, who is one of the neighbours on the hill. This holiday home is located in a relaxing, green and hilly area and has an unspoilt beauty. On the same estate, there are four self-catering cottages completely rebuilt in 2014, but keeping the old charm with antique beds, beautiful chandeliers, old stone walls, but modern bathrooms, well equipped kitchens and spacious terraces perfect for breakfast by birdsongs, for a sunbath or a romantic dinner by sunset. There are 3 more houses on the same plot. And although there is space enough (6.000 m²), please know that you can have neighbours. The advantage can be that these houses can also be rented together and be a marvelous place for a family up to 14 members. Quinta Vila Nova is an idyllic place for amazing holidays.